Poke the Guy is the latest release by Microgaming and its here at Slotsbaby breathing new life into online slot machines. Long gone are the classic slots and welcome to the fun and vibrant world of cartoon landscapes where players must try to take down the giant Guy who is going around wreaking havoc across the city. But how do you take him down? You have to aim at him and hope that you get a direct hit to bring him down! Even though it is different from other Slots games, you can still place bets by trying to get a successful hit on the Guy. Microgaming was established back in 1994 and they now have over two decades of gaming software experience. Based on the Isle of Man, they produce some of the most innovative and sophisticated online slot games on the market. In fact, their games are so well made that they even won the Innovation in Slot Provision at the EGR Awards. They are leading the way when it comes to making the best casino games in the industry, with their Dark Knight Rises game being the first ever online slot to be optimised for the Samsung Galaxy Gear 2 Smartwatch. Additionally, their Mega Moolah slot even holds a Guinness World Record for the biggest jackpot pay out in the history of online slot gaming! They are continuing to make a splash in the world of slot gaming as they have produces over 600 slot games to date with more being made each year. And many more! If you love promo's, check our UK slot bonuses today. You can play Poke the Guy from as little as 0.01 per throw or up to £30 per throw! To start playing Poke the Guy, you have to choose from a selection of items to throw at the Guy. Each time you throw an item means placing another bet, and if you manage to hit him, you'll be given a random pay out with multipliers of up to 500x! There are 5 different objects you can choose to hit the Guy with, and each of them represents a different bet amount. These objects are fun items which can consist of anything from a rubber duck to fish, durian and more! 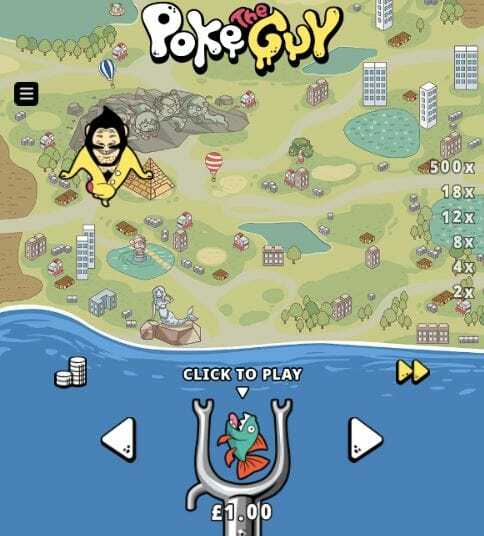 Unlike other online casino games, Poke the Guy has no special features and solely focuses on the gameplay. This game has a stunning 94.89% RTP which keeps players coming back for more great chances to win fantastic cash prizes! The pay outs for this game are pretty great and have some awesome multipliers on offer. These pay outs start from 2x and go on to increase by 4x, 8x, 12x and 18x your bet amount. The pay outs are represented by clouds and each higher pay out will take the form of an even bigger cloud! The change in pace from regular online slot machines is very refreshing with Poke the Guy and it is a game you'll find yourself coming back for time and time again. If you enjoyed this online slot game why not play another great one, called Wild Jane.